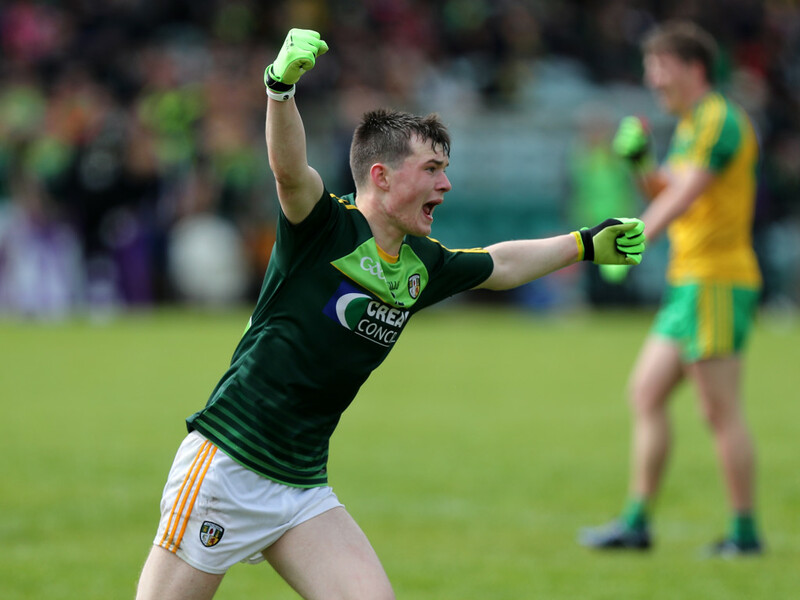 ANTRIM toppled last year’s Ulster Minor champions Donegal after extra-time in a thrilling clash in Ballybofey in Sunday. The Saffrons bossed the first half but a fortuitous goal from Donegal skipper Pedar Mogan kept the hosts in touch. Leading 0-12 to 1-5 at half-time, Antrim played second fiddle after the break as Donegal gradually reeled them in and the sides were level with two minutes of normal time remaining. A late point from substitute Lanty Molloy looked to have sealed a semi-final berth for the defending champions, but a foul on Eoghan McCabe allowed the excellent Liam Quinn to take the game to extra-time. Donegal’s second goal from full-forward Oisin Gallen again gave Donegal the upper hand, but Antrim refused to give in and a point from captain Eoin Nagle kept their hopes alive heading into the second period of extra-time. As Donegal passed up a series of chances at the other end, it was left to Saffron substitute Ruairi Brolly to lead the way with two stunning points from play to tie the game once more. As both sides frantically searched for a winner, mistakes were inevitable but it only added to the drama. Yet, the coolest man on the pitch seemed to be Creggan’s Tiarnan McAteer as he took a pass from Jack Lenehan. The wing forward took one look at the posts and fired over in the final minute of the game to seal a famous win for the Antrim minors. As manager Hugh McGettigan composed himself afterwards to speak to the media, he was mobbed by a succession of players, keen to praise their manager. McGettigan, in turn, deflected the praise onto the players, who showed character beyond their years in rallying against the odds to defeat last year’s champions. “It was a very enjoyable game. We had a good start and then we conceded a bad goal,” said McGettigan. “We really worked hard, both towards the end of the second half and in the first half of extra-time once they scored the (second) goal. It was an amazing performance against the Ulster champions. It is a great lift for Antrim in the future. To score 21 points in a Championship game is outstanding. “This is a great group of lads and they have worked really hard. Antrim gained a healthy lead in the opening 10 minutes, but it could have been a very different opening for the Saffrons. The visitors were indebted to goalkeeper Michael Byrne, who made two brilliant point-blank saves in quick succession to deny Gallen and Mogan. McAteer (two) and Nagle were on target early on for the Saffrons before Quinn took centre stage to score his side’s fifth point after nine minutes. His blistering pace and composed finished left packed Donegal defence trailing in his wake. When he followed John McCaffrey’s excellent effort to extended Antrim’s lead to 0-7 to 0-2 on 15 minutes, Donegal took action. Full-back Aaron Deeney was detailed to man-mark Quinn with Luke Gavigan dropping in as a sweeper. Yet, Quinn was on fire and he left his handlers beside to fire over another glorious point on 18 minutes, which was followed by a free two minutes later. When Ronan Kelly pointed on the 20-minute mark, Antrim had built up a seven-point lead. However, Donegal were gifted a lifeline when, completely against the run of player, they struck for goal. Byrne, who made those two early saves, misjudged the flight of a free from Mogan and, at the last second, the ball dipped under the crossbar and behind the line. To their credit, Antrim regained their composure and a foul on Quinn led to a pointed free for Kelly later in the half after Paddy Dolan had scored for the hosts. Gallen then landed a superb point for Donegal but, fittingly, Quinn had the final say in a breathless half of football as his free gave Antrim a 0-12 to 1-5 lead at the break. Donegal upped the ante visibly in the second half and points from substitute Thomas McGowan and Gallen cut the gap to two points. Kelly replied with his third of the afternoon, but Antrim found scores harder to come by in the second half. Conor O’Donnell and McAteer exchanged points as the game entered the final 10 minutes of normal time. Donegal appeared to be finishing stronger as Dermot McErlaine dropped a couple of 45s short. Substitute Shay Doherty showed the benefit of fresh legs when he fired over two points in the space of a minute to level the game on 58 minutes. With Antrim making a number of unforced errors, Donegal seized the opportunity to hit what appeared to be the winning score when Mogan teed up Molloy on the hour mark. The sideline official signalled four minutes of injury-time to give Antrim a chance to salvage the game. They almost plundered a late goal chance but Eoghan McCabe was hauled down by his opposite number Jack McKelvey as he cut a dash towards goal. McKelvey took a black card for his team and Quinn made no mistake from the free. Antrim’s Dermot McErlaine was also shown a black card after he slid into an opponent on the wet surface. The Saffrons suffered a double blow early in extra-time when substitute Kealan McCann was shown a black card for a third man tackle before Donegal struck for a second goal. Byrne made yet another excellent save to deny Aaron Doherty from close range, but full-forward Gallen was on hand to tap home the rebound. Malachy Doherty hit a fine point in reply but Colin McFadden’s point gave Donegal a 2-14 to 0-17 lead. The final score of the first period of extra-time was an inspirational one from Saffron skipper, Eoin Nagle. Donegal’s wayward shooting cost them dearly in the second period of extra-time but, in Ruairi Brolly, Antrim had an expert finisher in their ranks. Sprung from the bench late in normal time, Brolly curled over two sumptuous points to tie the game once more late in extra-time. There was still time for a winning score and Tiarnan McAteer seemed to have all the time in the world as fired over the winning point after 80 minutes of non-stop action. A final attack from Donegal failed to yield an equaliser and Steven Campbell’s full-time whistle was the cue for a pitch invasion by the extended Antrim panel. As his players celebrated, McGettigan took a few minutes to console a Donegal player after the game. The Rossa clubman was acutely aware that, on another day, it may have been the Donegal players jumping for joy, such was the nip-and-tuck nature of the game. “We knew the crowd would come in as the game went on and we had the lads prepared for that as best we could,” added McGettigan. “We have real heart in that team and it showed with guys played on no matter what. Last year, Liam Quinn gave a glimpse of his potential in Antrim’s opening round win over Fermanagh but his summer was ended when he broke his leg late in the game in Brewster Park. He returned to help St Mary’s Magherafelt win the MacRory Cup back in March and, on Sunday, he gave the Donegal defence the runaround. The Creggan dynamo hit 0-7 (0-3 from play) and had a hand in a number of scores for his side. Found himself repeatedly targeted for ‘special attention’ by his markers but remained composed throughout. Despite an error in judgment for Donegal’s opening goal, Michael Byrne also had a fine game, making three outstanding point-blank saves. Tiarnan McAteer, Eoin Nagle, Eoghan McCabe and Ronan Kelly also impressed as did substitute Ruairi Brolly, who popped up with two crucial points in extra-time. Donegal’s full-forward Oisin Gallen was the best player for the home side, scoring 1-2 from play. DONEGAL: C Randels; L Gavigan, A Deeney, C McGlynn; C McFadden 0-1, J McKelvey, P Murphy; R Doherty, C O’Donnell 0-2; P Dolan 0-1, A Doherty 0-2, B O’Donnell; P Mogan 1-2 (1-1 frees), O Gallen 1-2, C McGroddy. Subs: T McGowan 0-1 for B O’Donnell (26mins), S Doherty 0-2 for Dolan (46mins), L Molloy 0-1 for McGroddy (50mins), J McSharry for C O’Donnell (61mins), M McGroary for McKelvey (Black Card replacement 62mins).